I need to tell you something: I’ve been lying. Or at least shrinking the truth. It took me until Sunday night in a room full of Christmas carols to realize it. I stood up for the chorus, “Sing Joy”, but I didn’t feel joyful. And I finally knew why. I have so many reasons to sing Joy. But I’ve been silent for months now. Silent in order to respect my friends who aren’t married or have fertility issues or who aren’t living in the moments they wish they were. Although our fertility road hasn’t been smooth, and this has been one of the most difficult years on record, I find myself this December in a plentiful place with so much to be thankful for. So much to be joyful in. A baby coming. My first book releasing. Dreams coming true. But I’ve been swallowing it. Shrinking down the goodness of it all to make it “manageable” for the torn ones around me. No one asked me to do it. I assumed it might help. But the guilt of my blessing is now a burden, and no one asked me to carry that. I just haven’t given myself permission to feel happy when my friends are grieving. It felt selfish, and I feared being perceived as flaunting what I have. We so rarely give ourselves permission to feel whatever we feel, to refrain from judging one emotion as good and another one bad. Most of us are stifling our anger, grief and joy because the people around us don’t know how to handle it. They can’t enter into it with us so we all do each other a favor and pretend the feelings aren’t there. But it’s a lie, and it’s toxic for our relationships and our souls. When my friends mom died a few years ago, everyone wanted her to hurry up and get over it. But she wasn’t “over it” – she still needed to grieve. As I drove down the highway to home one night, I whispered permission to her. Permission to be, to feel, to not squelch or quiet or diminish the pain. She had the right to feel exactly how she felt. For our souls to be healthy, we need honesty, but first we need permission. I need you to give me permission too. I want to enjoy this season of expectation and a longing fulfilled with you without feeling the scorn of your judgment. I want to know you are happy for me, that we are welcoming a long-awaited baby, that doors have opened for me to chase a dream down. I’ve not felt an ounce of judgement from anyone, to be fair. I’ve only felt your celebrated encouragement. I am so thankful for that. I want you to know, though, I’m hurting with those who hurt. And I am angry at injustice and sickness that steals from all our lives. But I can manage all that empathy and still feel overwhelming gratitude that I am where I am. Finally. So let’s be in this together. Let’s support each other, not assuming the worst but the best. This life and all the disappointment and waiting and grief is hard enough without having to pretend the joys don’t matter. Besides, what if my joy is someone else’s hope? Or what if your sadness expressed resonates perfectly with someone else, still gathering the courage to share their heartbreak? Humble honesty is what I want from you. And I will do my best to give it. 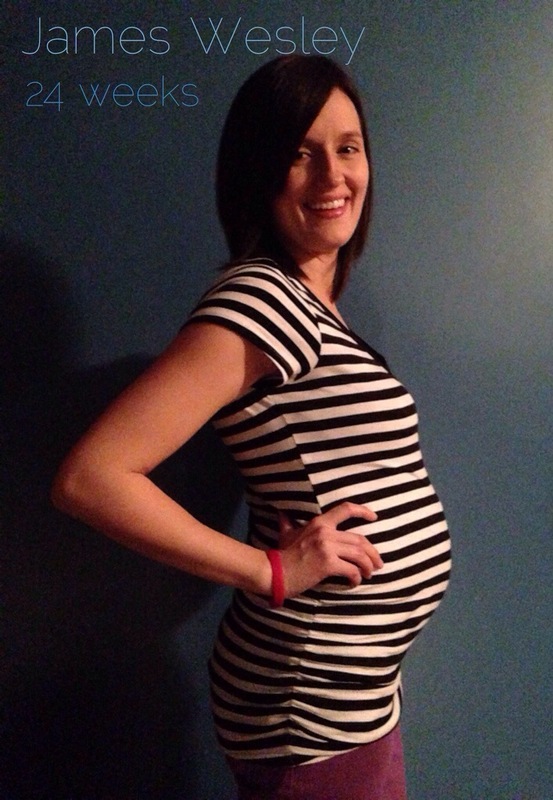 So without further ado, pictures of me and the baby growing from Week 12 and 24. I am 24 weeks today, and as you can see, we’ve given our guy a name and everything. James Wesley. Another revolutionary boy. I am so honored to raise these fiery men who will certainly turn the world upside down. Congrats, Sarah. You deserve to openly feel the joy. Please do so and I’ll feel joy for you as well. Breia, thank you so much. I hope my honesty here liberates others to feel exactly what they feel without apology, no matter what that is. You should celebrate! What a strong name out new nephew will have! So good! I love that you realized that by not sharing you could be stealing someone else’s joy or hope. Thank you, Faith. That was very liberating to realize. Aw Lori, thank you. I’m such a mess. I’m hoping I’m not coming across like a selfish a** here. I feel incompetent on some of this feeling crap sometimes. Lol. Sarah, I have prayed for baby Siders since visiting in September. Thrilled to hear all is well. My husband, I and our church will continue to pray for James, mother and family. Thank you for sharing this wonderful news. Without you sharing, I would not have known God has been answering our prayers!